But just as reliable as hers ever was. Hand crank-style flour sifters have been around for generations because they continue to work flawlessly sift after sift. 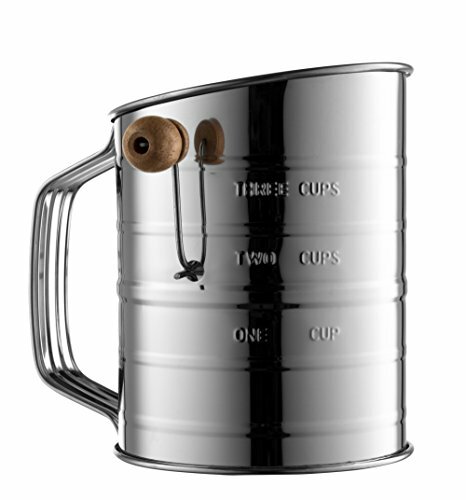 The Bellemain 3 Cup Flour Sifter gives the home baker plenty of room to measure out and sift a full 3 cups of flour or sugar at once. Sifter weighs only 6 ounces, so hand fatigue is never an issue - even if you suffer from arthritis. Other sifters, like squeeze handle models, use two or more mesh screens that trap pellets of ingredients, clogging with clumps and lumps, making the sifter a pain to clean. The Bellemain Sifter makes sifting and cleanup easy breezy. It wipes clean in seconds. The Bellemain Sifter's volume measurements are stamped right into the stainless steel so they are easy to read from the inside and the outside of the sifter cup. The cup gives you plenty of extra room so you know you'll always get a full 3 cup measurement, unlike other sifters that barely give you enough room and keep you guessing about measurements. Coarse ingredients like oat bran and almond meal can be a challenge for lesser sifters. The Bellemain Sifter can process them easily without any added pressure and then moves on to confectioners sugar and cocoa powder without missing a beat. Aerates your dry ingredients smoothly to give you lighter, fluffier baked goods. Order Your New Bellemain Flour Sifter Today And You Can Be 'Cranking' Out More Delicious Muffins, Cakes, And Pie Crusts By This Weekend. CLASSIC RELIABLE HAND CRANK AND SINGLE MESH: Professionals prefer crank-style sifters over hand squeeze sifter models because they can stand up to repeated use without tiring out your hand. Sifting is effortless and clean up is super simple - no multi-layers of mesh for ingredients to get stuck. THE DOUBLE LOOP AGITATOR LEAVES NOTHING BEHIND: Lumps of flour and sugar can get left behind to clog the mesh screens when using squeeze handle models, but the Bellemain Flour Sifter cranks smoothly, capturing everything. Works great with fine and coarse flours like almond meal and oat bran. EASY FOR BAKERS WITH ARTHRITIS TO USE: Squeeze handles are hard to work and require hand strength - which means they can wear you out quickly. But the Bellemain Sifter's hand crank operates smoothly and effortlessly - lightweight flours and sugars practically sift themselves.